THE INDEPENDENT Irish human rights organisation the Committee the Administration of Justice (CAJ) has welcomed the publication of a major international report on counter-terrorism and human rights published by the International Commission of Jurists (ICJ). "CAJ has always contended that human rights abuses fed and fuelled the conflict in Northern Ireland. Unless lessons from places like Northern Ireland are taken on board, advances in protecting the dignity and rights of all human beings will be undermined, perhaps irretrievably." It is the product of a three year global study which examined the compatibility of laws, policies and practices, which are justified expressly or implicitly as necessary to counter terrorism, with international human rights law. The Panel was chaired by Justice Arthur Chaskalson, Former Chief Justice of South Africa and the first president of South Africa's Constitutional Court and consists of highly respected judges and lawyers of world renown from different regions and legal traditions. CAJ hosted a visit to Northern Ireland by the Eminent Jurists Panel in April 2006 where they received testimony from, among others, families of victims of paramilitary and state violence, the Chief, Deputy and Assistant Chief Constables of the PSNI, members of the legal profession, the Director of Public Prosecutions and human rights organisations. 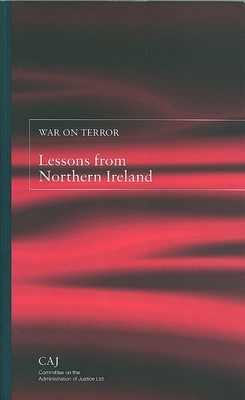 Drawing on the material gathered during this visit, and based on its own experience, CAJ itself produced a major report in January 2008 entitled War on Terror - Lessons from Northern Ireland. This document was last modified by David Granville on 2009-04-30 11:29:48.